The Babadook is a 2014 horror film directed by Jennifer Kent. The monster in the film, called the Babadook, has become a queer meme and icon. 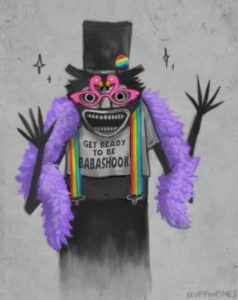 Sometimes I only see the bad elements of the internet but then I remember we all decided the Babadook was gay. As jokes on Tumblr are wont to do, the Babadook’s queerness took on a memetic life of its own. The most salient running gag is that the “B” in “LGBT” actually stands for Babadook (which has caused some backlash in those worried about bisexual erasure, unless you interpret it to mean that the Babadook is bisexual as well); others have argued that he’s clearly in a relationship with the Bye Bye Man, another recent horror movie villain. Where does Babadook come from? Helmed by Jennifer Kent and based on her short film Monster, The Babadook was a surprise hit in 2014 for being a small-budget horror film. It follows a distraught widow and her imaginative child as they confront visions of a character in a pop-up book, Mister Babadook. In it, the Babadook is a nightmarish monster with a huge mouth, long talons, amorphous black body, and creepy top hat. The Babadook wasn’t terrifying to everyone, though. In 2016, people on the social media site Tumblr began joking that The Babadook film and monster were gay, an idea that began in jest but that quickly went viral. 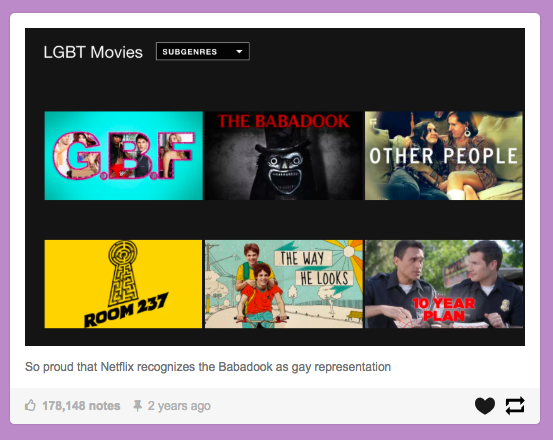 One such post shows the film categorized in a section of LGBT movies on Netflix (although it was probably doctored), and social media users ate it up, engaging in mock discourse on the LGBTQ subtext of the film. 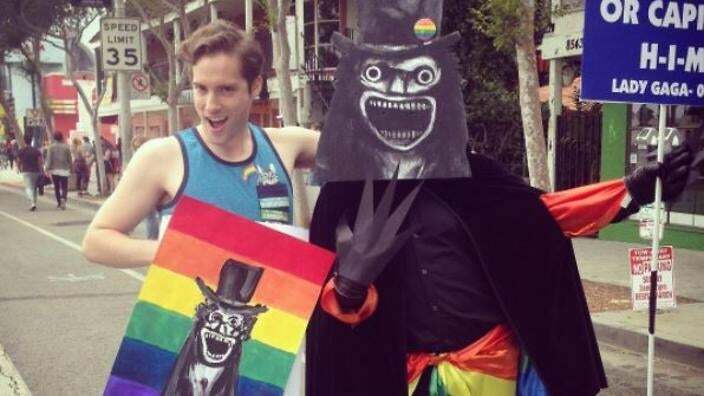 The Babadook character went on to make appearances in gay pride parades, notably in Los Angeles in June 2017. The LGBTQ community leaned in, identifying legitimate LGBTQ themes and issues in the film. 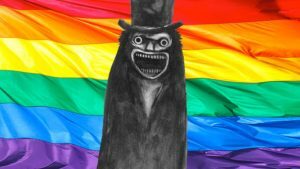 Many likened the suppression of the Babadook’s existence in the film to the struggles historically faced by the LGBTQ community for acceptance and recognition. After its release, critics and the public discussed the film as a powerful portrait of grief. Others lauded it as a horror film directed by a woman. A testament to its success, the film earned a 98% rating on the review aggregator site Rotten Tomatoes and took in two times its budget back in revenue. In 2017, the queer embrace of the Babadook got the attention of major publications like The Guardian, Teen Vogue, and the LA Times. They explored how this horror movie character became an unlikely icon in the queer community, which was Baba-shook by the Babadook.